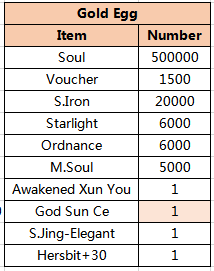 Gain God Sun Ce, Awakened Xun You and Spinel Bag in Egg-Hitting! This Day will come soon. And we have prepare a special event for players to join to get much more rewards. 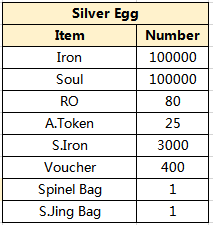 Special hero and wonderful rewards are hidden in the golden egg and silver egg which have a big change in here. You could get a hammer by only recharging 120 Gold. And more tidy resource species of resources are here. Come on, my brother! 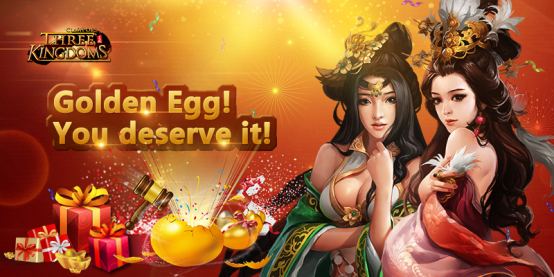 God Sun Ce, Awakened Xun You, S.Jing-Elegant Image Card are hidden in the Egg. What’ s more, the Rare Hersbit+30 are put in the event. Powerful heroes can help you fight in the world. As you can see, this time we focus much more useful resources on eggs. Players can claim intently a tremendous amount of rewards except heroes. Please don’t miss this event! Wish you good luck! Hammers can be used to smash eggs! Our special hero God Sun Ce, S.Jing-Elegant Image Card and Awakened Xun You are hidden in Gold Egg, S.Jing Bag and Spinel Bag are hidden in Silver Egg. Players will get 2 hammers for free during the event.